Gateway Technical College welcomes Foxconn to Southeastern Wisconsin! Gateway is working closely with company representatives to identify their immediate hiring needs as well as longer term needs for which residents will require training only Gateway can provide. 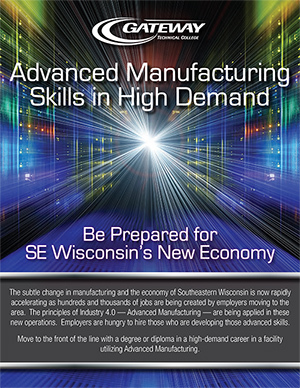 Gateway announces two new programs to address the needs of Foxconn and other advanced manufacturing companies moving to SE Wisconsin. Advanced Manufacturing: Advanced manufacturing combines mechanical, electronic and information technology to streamline the manufacturing process through intelligent automation. Advanced manufacturing facilities use advanced software and robotics technology to make their processes as efficient as possible. If you enjoy troubleshooting technology and working hands-on with machinery, this program is for you. Supply Chain Management: Supply chain managers oversee the process of moving a product from the supplier to the customer, including implementing strategies to keep costs low and improve service. If you’re an analytical and strategic-minded person who enjoys working with other people, this program is for you. Gateway, with its Integrated Manufacturing and Engineering Center and the Reader Precision Machining Manufacturing Center, has been nationally recognized for its leadership in Advanced Manufacturing training. Gateway has also been singled out for its exceptional relationship with new companies settling in our region by providing the career education employers require. Whether high tech, manufacturing, health, business or service industries, Gateway is an employer's first stop. Be Prepared for the jobs coming to southeastern Wisconsin by training with the best. Find out more about Gateway’s SC Johnson Integrated Manufacturing and Engineering Technology Center.